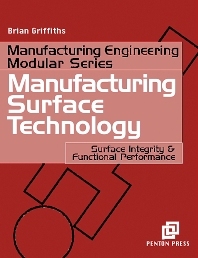 The first title in the "Manufacturing Engineering Modular" series, the publication of this book marks recognition of the effect of surface finish obtained in manufacture ("surface integrity") on the functional performance of product, in terms of such factors as fatigue, corrosion and strength. It is a concise work, intended chiefly for undergraduate and postgraduate students, which should also provide useful material for the professional manufacturing engineer. Dr Brian Griffiths is a Reader in the Department of Systems Engineering at Brunel University. He is involved in teaching and research concerning manufacturing engineering and metrology. He has been involved in research work concerned with ‘surface integrity’ and manufacturing engineering for 25 years. He sits on several British Standard Institution (BSI) and International Standards Organisation (ISO) committees. He is currently Chairman of the BSI committee on ‘Design for Manufacture’.